3 Are There Easy Ways to Whiten Teeth Without Whitening Strips? Everyone wants a bright, white smile. Many factors significant staining of teeth such as certain foods or liquids, smoking and age. Having your teeth bleached by a dentist or using an at-home bleaching kit are two options that can remedy this problem, but these chemicals are not necessarily good for your teeth. 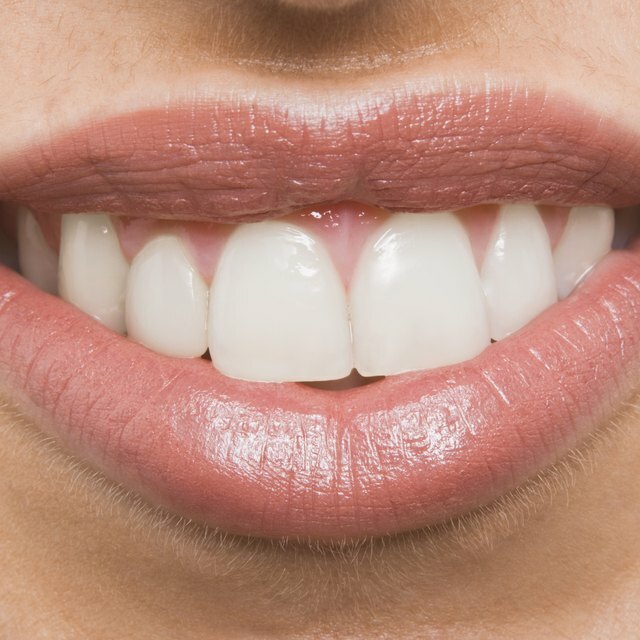 Finding natural products that whiten teeth is a much safer, less expensive avenue by which to prevent or remove stains. You may have combed lemon juice through your hair to achieve blond streaks as a teenager. Lemon juice has the same bleaching effect on your teeth. Simply use your finger or a soft cloth to rub the lemon juice all over your teeth for a few seconds. Salt can also be mixed into the lemon juice and is quite useful in removing plaque buildup. The gritty texture scrubs teeth without causing damage to the enamel. Simply mix salt with lemon juice, and use a toothbrush to brush the entire surface of your teeth. Immediately afterward, rinse your mouth thoroughly with warm water to avoid any acidic damage. According to NaturalTeethWhitening.net, baking soda has teeth-whitening effects. Most toothpastes incorporate baking soda into their formulations, but it can also be used on its own in a more concentrated form. You can mix it with water and dip your toothbrush into the mixture, or you can place the baking soda directly onto your toothbrush. Then brush regularly, the same as if you are using toothpaste, and rinse your mouth with water. You can also place baking soda into a teeth-whitening tray and fixate it to your teeth, just as you would do when using a bleaching kit. Leave it on for up to an hour, then rinse with water. Add another whitening agent, hydrogen peroxide, to baking soda to achieve more dramatic results. Be very careful not to swallow, and rinse thoroughly. Following any of these uses, brush with a regular toothpaste to remove all traces of baking soda from your teeth. Strawberries are a sweet alternative to lemons for teeth whitening. Their acidic content and abrasive texture can remove buildup and whiten your smile. Rub the strawberry back and forth across the surface of each tooth, and then rinse thoroughly with water. You can use whole strawberries or cut them in half, depending on your preference. The abrasive nature of apple cider vinegar can provide effective teeth-whitening benefits. Dip your toothbrush into the vinegar and brush regularly. Rinse your mouth well, and use caution when implementing this method as apple cider vinegar is highly acidic. Sometimes your teeth feel dirty while you're busy at work or school. If you are unable to brush your teeth, preventing staining and removing buildup is still possible. Swishing with water can loosen food particles and remove recently consumed liquids. You can also eat crunchy foods, preferably vegetables, to scrape any excess matter from your teeth. Based in North Carolina, Sheena Ingle has written freelance articles since 2009. She has published work in the areas of beauty and style, fashion and entertainment for various websites. Ingle also provides proofreading services. She attends Regent University, pursuing a Bachelor of Arts degree in English with a cognate in professional writing.